We are entering an exciting era in the advancement of human health. New technologies and a greater understanding of disease are driving a revolution in precision medicine. Physicians are able to identify and treat maladies earlier, more effectively and at a lower cost. Agilent is at the forefront of this effort, equipping researchers and medical professionals to better understand, diagnose and treat diseases. One key area where we contribute is in genomics. 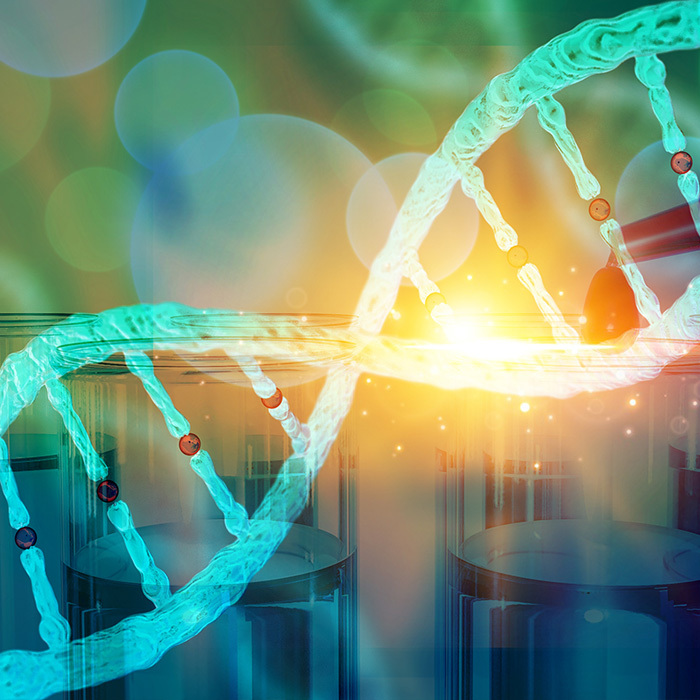 While genetics studies individual genes, genomics studies all parts of an organism’s genes. By analyzing the entire human genome (our entire DNA content), scientists can better understand the cause of a disease. Next-generation sequencing (NGS) enables scientists to “sequence” (map) an entire genome quickly and inexpensively. Agilent offers solutions for both Amplicon-based targeted NGS and Hybridization-based targeted NGS. Agilent’s Alissa Clinical Informatics Platform delivers data analysis and interpretation of NGS and CGH data. Electrophoresis is used to separate DNA, RNA and protein molecules. Agilent’s Bioanalyzer Automated Electrophoresis provide sizing, quantitation and purity assessments for DNA, RNA and protein samples. Agilent’s TapeStation Automated Electrophoresis provides automated sample processing for quick and reliable sample quality control for any NGS workflow. Microarrays are collections of DNA “spots” attached to a solid surface. Researchers use them to detect copy number changes on a genome scale, study how various genes are “expressed” (turned on and off) or regulated in cells, or study how proteins and DNA interact. Agilent has microarray platforms for CGH (comparative genomic hybridization), CGH+SNP (single nucleotide polymorphisms), Gene Expression, miRNA and Epigenetic and Specialty Microarrays. Agilent also offers CGH diagnostic testing with its GenetiSure Dx Postnatal Assay*, enabling clinicians to make informed decisions with a complete diagnostic microarray platform for postnatal analysis. Polymerase Chain Reaction (PCR) can take a small sample of DNA and generate millions of copies for research and analysis. Agilent’s PCR products offer a full portfolio of products that help you obtain quality results more rapidly. Agilent’s portfolio also includes Real-Time PCR (qPCR) system that includes the newest generation AriaMx and AriaDx (IVD) system. Agilent’s Oligo Library Synthesis (OLS) technology has been driving scientific innovation through collaborative research with many of the world’s leading non-profit and academic institutions. OLS allows Agilent to synthesize the highest fidelity, longest oligos in the industry, and we are now applying this technology to make CRISPR/Cas9. Agilent’s Mutagenesis and Cloning portfolio include the fastest and latest generation kits, competent cells, vectors, and enzymes for molecular biology research for any downstream applications. Protein Expression solutions from Agilent include a comprehensive line of competent cells, vectors, antibodies, antibiotics, transfection reagents, and specialty kits for protein expression and purification applications. Automation of liquid handling protocols provides higher accuracy and reduces hands-on time, both of which are critical to genomics applications. Agilent has automation solution like the Bravo Automated Liquid Handling Platform to address this need. Agilent recently launched a major website update for our Genomics portfolio. Customers can benefit from a better and integrated information experience and easily navigate to industry-leading products and solutions.